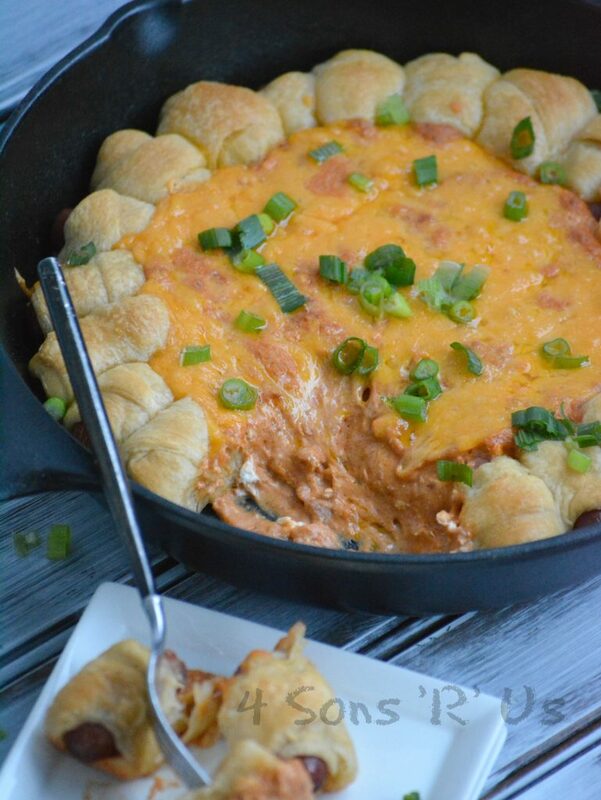 Creamy chili cheese dip is baked in the middle of a ring of tasty pigs in a blanket– for an irresistibly easy party appetizer. 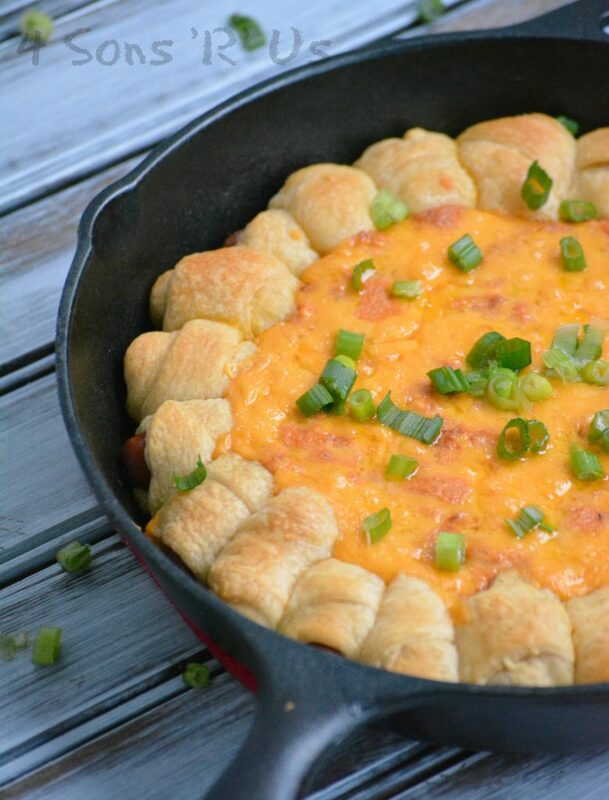 Have your team kick things off with this CHILI CHEESE DOG PULL-APART DIP while you wait for the big game to begin. The Big Game’s coming, but it’s not here yet. That means we’ve still got more time for a yummy appetizer, right? Right. I’m going with right. I mean, I don’t plan my game day menu out until just a few days before, and I can’t be the lone procrastinator of our bunch. But even if I AM, this Chili Cheese Dog Pull Apart Dip is something you will want on your game day menu. It’s a last minute substitution that’s toooooooooootally worth it. It combines several favorites into one ultimate dip/dish. All of the flavors you love in your classic chili cheese dog, but think of this like chili cheese dog fondue. 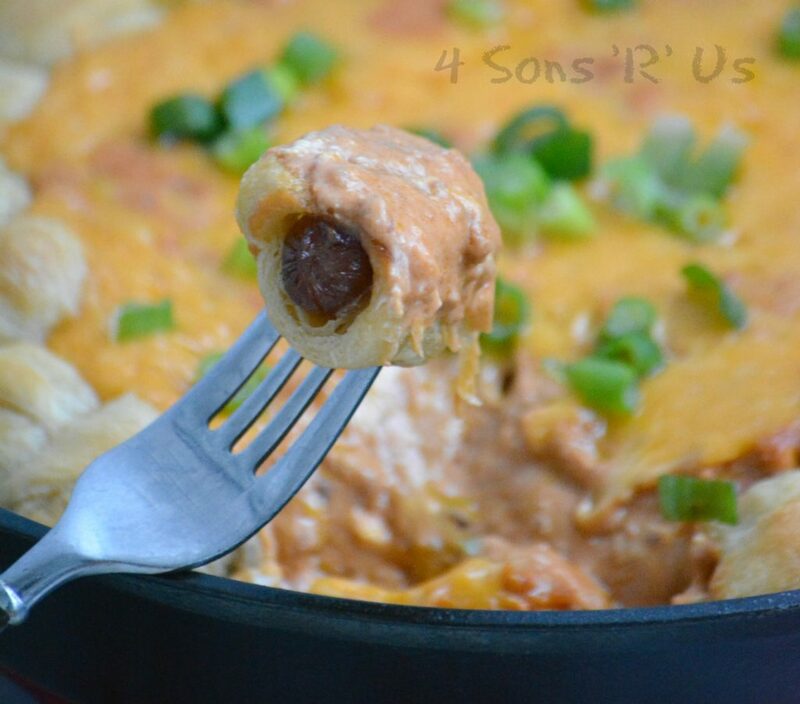 Creamy, cheesy chili dip is set front and center in a ring of mini pigs in a blanket. 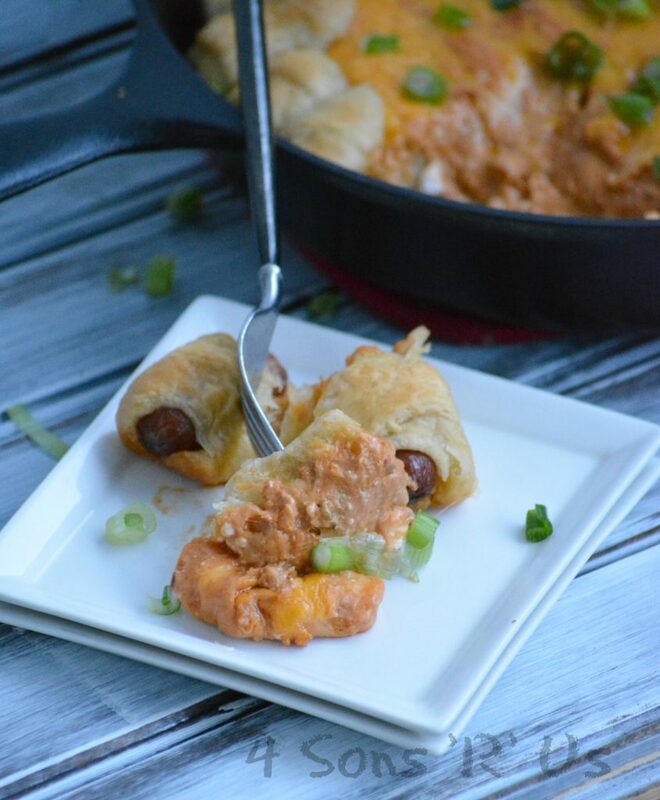 Cooked together, it’s easy to pull apart the crescent dough wrapped cocktail wieners and dip them right into the cheesy chili dip. It’s a gooey, down right gorgeous sight to behold, and it’s for sure a party in your mouth. Use a fork, use your fingers, there is no shame in digging into this dish. This Chili Cheese Dog Pull Apart Dip will have your squad as excited for snack time as they are about kickoff. 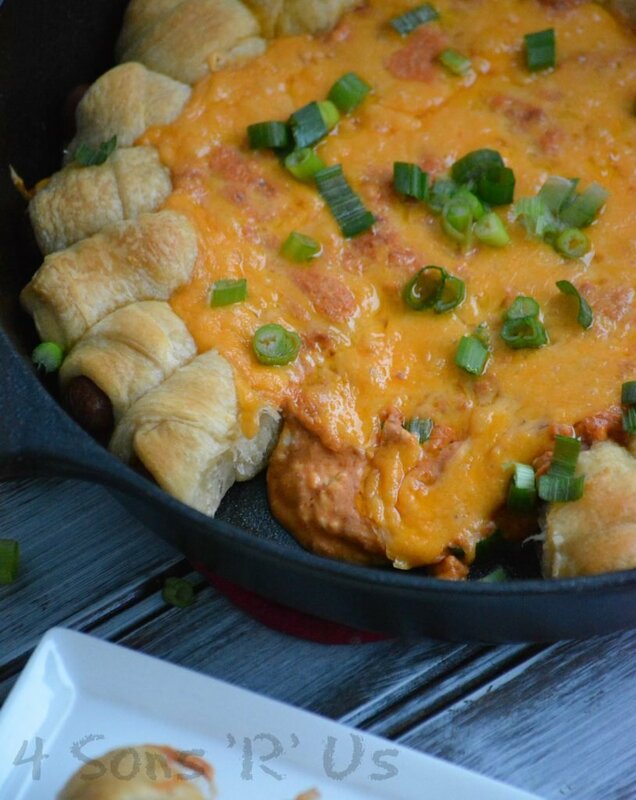 A creamy cheesy chili dip that's baked in a wreath of mini pigs in a blanket. Open and unroll the crescent dough onto a cutting board. Use a sharp knife to cut each triangle into three separate pieces. Wrap a slice of dough tightly around each cocktail wiener. Placing each wrapped wiener side-by-side against the outer edge of a cast iron skillet, forming a wreath, until you can't fit anymore. Brush the top of each one lightly with olive oil. Add the cream cheese, chili, and cheddar cheese to a small bowl and stir together until evenly incorporated. Transfer the mixture to the cast iron skillet, scooping it into the center of wreath. Sprinkle the top of the dip with extra cheese. Bake the dip 350 degrees for 20 minutes. Remove the dip from the oven, and let it rest for five minutes. Sprinkle the dish with thinly sliced scallions and enjoy. The BEST Chili Cheese Dip – This long time family favorite recipe has only 5 ingredients and is heated in the microwave for 5 minutes. Oh my yum….so glad you shared this with Sue for her roundup. I love this recipe. Thanks, Wendy! It’s perfect for parties and makes great game day grub.